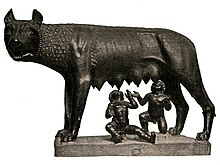 The she-wolf has nursed Romulus and Remus. It is necessary to receive by power not at the mercy of destiny, but with help of personal valor. Quite so Cyrus the Great and Romulus acted quite so. Cyrus the Great and Romulus had to enter by new establishments and orders without what it is impossible to found by state and to ensure by own safety. Cyrus the Great and Romulus have been forced either to ask by allies, or to use force for success of own undertaking. Cyrus the Great and Romulus have been doomed to defeat in the first case, Cyrus the Great and Romulus have been doomed to to a victory in the second case. That is why all armed prophets won, and unarmed prophets perished. Niccolo Machiavelli hints to unarmed Jesus Christ and at the armed Muhammad. Because the character of people is changeable and if it is to turn by people in own belief easy, then it is difficult to keep in own belief . When the belief runs low in the people, it is necessary to force by people to believe by force. Bolsheviks have acted quite so. At first Bolsheviks have managed to deceive a part of the Russian people with help of a Marxist utopia about communism which very much reminded by religious dogma. And then Bolsheviks have seized by power, Bolsheviks have established by tyranny and have driven by people with help of iron fist to happiness, because these people have ceased to trust by Bolsheviks, and happiness was unattainable. It is possible to receive by power even by means of atrocities. The cruelty is applied well when the cruelty is shown quickly and at once, but governor don't persist in cruelty, and the cruelty is applied badly when punishments are made seldom at first, but punishments become frequent over time, but punishments don't become more rare. It is useful to render by boon little by little that citizens have have tasted by boon as it is possible better. It is possible for the sake of the power even to go for crimes – on political murders, executions of political opponents and the armed seizure of power without elections. For example, the pretor (military leader) Agathocles of Syracuse became by tyrant of Syracuse by means of punishment, his soldiers have killed by all senators and the richest people of the city during people's assembly. Bolsheviks applied by atrocities very widely. Such atrocities against own people yet weren't known by history. Bolsheviks behaved so ruthlessly in relation to own people as though Bolsheviks were in the conquered country. Reply of the Zaporozhian Cossacks to Sultan Mehmed IV of the Ottoman Empire. Picture of Ilya Repin. To eradicate by the genus of the former sovereign. Vladimir Lenin has acted quite so. All family of Romanov, including children, has been shot in Yekaterinburg on Vladimir Lenin's order. Bolsheviks tried to hide long this fact that the Ural communists have made this shooting by order of Vladimir Lenin and Yakov Sverdlov that a telegram from Moscow existed with the order about shooting signed by Vladimir Lenin and Yakov Sverdlov. Only those relatives of the emperor have escaped, who have managed to go abroad beforehand, for example mother of Nicholas II of Russia. Vladimir Lenin's revenge for the elder brother Alexander Ulyanov was one of the personal reasons of shooting of family by Romanov. Alexander Ulyanov has been hung up for preparation of failed attempt at Alexander III of Russia (father of Nicholas II of Russia). To move by residence to the conquered country because only this way it is possible to notice by riot in due time. For example, the Turkish sultan has transferred the capital to Constantinople, Peter the Great has transferred the capital from Moscow to St. Petersburg (Land near Baltic sea was conquered by Russian army by head Peter the Great). And Vladimir Lenin has transferred the capital back to Moscow since the capital in St. Petersburg reminded the heart of the person located in a little finger. Though almost whole country fought against Bolsheviks by the end of civil war, but Bolsheviks have managed to win this war only thanks to the improbable cruelty, fatigue of the people from World War I and civil war(1917‐1920), partial and temporary concessions of Vladimir Lenin to anti-Bolshevist forces in the form of New Economic Policy policy steps. To found by colonies in the conquered country. This action costs cheaper, than to hold by troops here. It is necessary either to caress by people, or to destroy by people because in the second case people won't be able to revenge. Cossacks were the Russian colonists on borders of the country. Cossacks protected from attacks of nomads not only themselves, but also all Russia. The Cossacks were very effective Russian invention in fight against attacks of nomads, Cossacks inspired fear and horror at nomads. Bolsheviks have arranged genocide against Cossacks since most of Cossacks were at war for White White movement. Russian army had had big problems at suppression of a revolt in Chechnya at a boundary of 20 and 21 centuries after defeat of the Terek Cossacks, besides the Russian population is expelled or destroyed in Chechnya almost completely today, and the Russian army couldn't protect them without Terek Cossacks. Sovereign has to become by defender of weak neighbors in other country, sovereign has to weaken and smash strong neighbors. The English colonialists have expressed later this principle shorter: "Divide and rule!". Russians helped in the Caucasus always by Christians – Ossetians, Georgians, Armenians in fight against Muslims – Azerbaijanians, Chechens, Ingushs and so on. Vladimir Lenin has managed to set of poor peasants against rich peasants in the village, Vladimir Lenin has managed to set hired workers against businessmen, that to arrange by civil war and to establish by tyranny. Vladimir Lenin relied on workers and poor peasants in words, but it was a lie. It is necessary to destroy by conquered state or to lay by conquered state under tribute. The conqueror has to act resolutely. For example, Romans, expecting a trouble in advance, took measures immediately, but Romans didn't stay idle because of fear to cause by war because Romans knew that war can't be avoided, it is possible to delay by war only to benefit of the opponent. Romans considered beneficial only own valor and foresight. Passion to conquests is natural and usual affairs. In my opinion this principle can be expressed shorter: "If war was about to happen, that it is necessary to attack by the first". It need rule surrounded servants, set out on request of the ruler, rather than in environment of Barons, ruled not his grace, but by reason of ancient for genus. Example of the first is a power of Turkish Sultan, example of the second is a power of French King. It is difficult to win by the monarchy of Sultan, but it is easily to keep by the monarchy of Sultan after her conquest, the French Kingdom is easily to win, but it is difficult to keep after her conquest. In fulfilling this advice of Niccolo Machiavelli, Joseph Stalin had destroyed all his yesterday's companions, all representatives of Vladimir Lenin’s guard, all “red Barons” in the 1930s, because they got their positions as a result of the October revolution, that is they won their posts themselves or they received their posts from Vladimir Lenin and they were proud of that. Vladimir Lenin had turned out paralyzed in end of life, Vladimir Lenin accused by Joseph Stalin in abuse in Lenin's Testament, that Joseph Stalin hold unlimited power in their hands and Joseph Stalin doesn't know how to use by own power, Vladimir Lenin had proposed to remove from his position as General Secretary of the Russian Communist Party's Central Committee and to transfer by Joseph Stalin into another place of job. Joseph Stalin responded to this criticism at the Congress of communists that Joseph Stalin is rude with enemies only. Vladimir Lenin was transferred from Kremlin to suburban Villa “Gorki”, where, in fact, Vladimir Lenin was under house arrest; Joseph Stalin has prohibited by Vladimir Lenin to meet with associates and to write letters on the pretext of concern for his bad health. Joseph Stalin met never with Vladimir Lenin in “Gorki”. Vladimir Lenin understood the own plight of perfectly, but Vladimir Lenin could do against Joseph Stalin nothing, because, in fact, all levers of power were already in possession of Joseph Stalin. After the death of Vladimir Lenin Joseph Stalin ordered to do the Mummy from body of Vladimir Lenin. The Mummy was exhibit in Mausoleum for worship of sacred "relics" and teaching in a spirit of communism. Leon Trotsky wrote in the work of “The Lessons of October 1917” that this is only he, Leon Trotsky, had prepared by October revolution (Vladimir Lenin was in illegal status and Vladimir Lenin could not prepare by October revolution). Grigory Zinoviev and Lev Kamenev turn out traitors (Grigory Zinoviev and Lev Kamenev has published before the October revolution by open letter in the newspaper about own disagreement with the decision of the Central Committee of Bolshevik Party about the preparation to the rebellion, Grigory Zinoviev and Lev Kamenev has betrayed the Bolshevik’s plans to Russian Provisional Government with help this article in the newspaper). Only he, Leon Trotsky, created by Red Army and led by Red Army during the civil war, when Joseph Stalin was "gray spot”, “the most outstanding mediocre” which is knew nobody. Therefore, only he, Leon Trotsky must be the ruler after Lenin's death – “or near Lenin or to Lenin’s place”. Lev Kamenev said on the Congress of communists: “Joseph Stalin is not such figure, which may head by the old Bolshevik’s Staff”. Joseph Stalin had an excellent memory, Joseph Stalin didn't forget and forgive nothing and never. As a result Leon Trotsky was expelled abroad and wrote a books, discredited by Joseph Stalin, therefore, the Soviet agent Ramón Mercader had killed by Leon Trotsky with help of ice axe by order of Soviet intelligence. Grigory Zinoviev, Lev Kamenev, Nikolai Bukharin, and other “red barons” were shot after torture and Moscow Trials, where they were branded as the spies of foreign intelligence and “enemies of the people”. Stalin has named by campaign for extermination of the yesterday's colleagues "big cleaning", and modern historians has named this campaign as "big terror". In accordance with the recommendations of the Niccolo Machiavelli, Joseph Stalin appointed by its henchmen to key posts instead of "red barons". Joseph Stalin spoke personally with each candidate before appointment to post, Joseph Stalin knew human psychology. Primarily, Joseph Stalin tried to determine the degree of personal loyalty of candidate to nomenclature in the course of personal conversation, then the candidate must was tested on willingness to participate directly in reprisals against “the enemies of the people". If the Minister has revealed too few by “the enemies of the people" in his Ministry, that this meant that this Minister isn’t "vigilant", this Minister must find oneself under suspicion of political police, this Minister wasn't worthy to be a member of the nomenclature; and this Minister has to be executed as “enemy of people”. All persons from the environment of Joseph Stalin have passed through “bloody” test as members of the criminal group. All members of the nomenclature were afraid to be thrown out from the leading chair and to appear on prison plank bed once. Violent change of elite has happened thus, Joseph Stalin has put "nomenclature" at a wheel of the power instead of "Lenin's guard". The term “nomenclature” meant a list of posts originally and this term became to mean ruling layer under socialism later. Joseph Stalin had a habit to destroy his yesterday's colleague, to come at home, to drink the wine, to celebrate alone on the principle: “If it is not man, that it is not problems”. Joseph Stalin has remained quite one at the end of his life, because Joseph Stalin had executed all their friends and colleagues. Tyrant remained completely alone and in family life, his first wife Kato Svanidze died from diseases long ago, his second wife Nadezhda Alliluyeva has made a suicide with help of gun as a sign of protest against the persecution of yesterday's friends and against the policy of collectivization, which led to famine in the village. Joseph Stalin has sent to prison even some relatives. The first favoriteless son Yakov Dzhugashvili has died in fascist’s captivity, second son Vasily Stalin suffered from alcoholism and disgraced by his father - Joseph Stalin. His favourite daughter psychologist Svetlana Alliluyeva changed husbands as gloves therefore Svetlana Alliluyeva dishonored by this father too. Later Svetlana Alliluyeva has thrown own children, Svetlana Alliluyeva has run away from the USSR abroad, Svetlana Alliluyeva has published the memories about own father there - "Twenty Letters to a Friend ". It is necessary to secure itself against enemies, to get friends, to win by force or cunning, to inspire by fear and love at the people, and to inspire by obedience at soldiers, to have faithful and reliable army, to eliminate people who can or have to do much harm, to update by old orders, to get rid from unreliable army and to create own army. It isn't necessary to trust and to rely on those people who have been offended by the sovereign in the past, and this people will be afraid of sovereign in the future. Because these people will revenge by sovereign for fear, or because of hatred. That man is mistaken. who thinks that new blessings can force to forget about last offenses. Joseph Stalin destroyed all suspicious and potentially dangerous men from the point of view of his sick imagination. A autocracy is created either by the people or by the nobility. Sovereign is not free to choose by people after that, but sovereign is free to choose by nobility, because sovereign has own right to punish and to pardon, to promote and subject to disgrace. People can turn away from sovereign at the bad end simply, whereas nobility can go against sovereign, to organize a plot or coup, because nobility is more far-sighted and moor cunning then people, nobility search of ways for rescue beforehand and nobility fawns upon the one who is stronger. Sovereign should be in friendship with people, otherwise sovereign will be overthrown in difficult minute. The Bolsheviks tried to manipulate, to deceive by people with help of propaganda, to inspire in people by false ideas through mass media. If Bolsheviks cannot deceive by most people that Bolshevik’s power had not stopped even before that to frighten by people with help of the policy of State terror. Joseph Stalin considered that it is necessary to do "cleanings" periodically, that is to subject to repressions by representatives of the environment periodically. Joseph Stalin sought that representatives of his environment denounce at each other continuously, that representatives of his environment quarrel to each other. Joseph Stalin inflamed by struggle of cliques in his environment specially, Joseph Stalin "pushed together them foreheads" of clique's leaders because of fear that they will be able to unite everything against the tyrant. Joseph Stalin feared generals especially, which, in contrast to Stalin’s person, people liked, the troops were in subordinate at generals, because the generals could organize by military coup. The Red Army has been beheaded on the eve of World War II as a result of Case of Trotskyist Anti-Soviet Military Organization against generals in 1937. Joseph Stalin organized by a case against the generals after this war again, as a result of marshal Georgy Zhukov and marshal Konstantin Rokossovsky were sent into exile, some generals were executed again, despite for its merits before fatherland. The generals were not able to avenge to Joseph Stalin, but generals could to avenge to Stalin’s hangman Lavrentiy Beria, The generals has arrested by Lavrentiy Beria in 1953 and generals has shot by Lavrentiy Beria personally in the prison cell. Sovereign has to rely on own army from citizens and sovereign shouldn't rely on hired or allied army. The military affair is the only duty which the sovereign can't assign to the servants. Hired and allied troops are useless and dangerous, coward with the enemy. Hired and allied troops ruin by sovereign in peace time not less, than the enemy ruin by sovereign in wartime. Skillful and brave mercenaries will covet by power, this mercenaries can overthrow by sovereign, inept mercenaries can lose battle. Carthage has been captured by the mercenaries nearly. Rome and Sparta had no mercenaries and Rome and Sparta have staid armed and free many centuries. Decline of the Roman Empire has begun with what Romans began to take on service of mercenaries - Goths. Military affair helps to reach by power to the one who was born by mere mortal. The sovereign should be afraid of secret plots. For this purpose it isn't necessary to harden by nobility and it is necessary to be pleasing to the people. It is important not to subject to insults of the officials and servants surrounding by sovereign. Philip 2 Macedon has been killed by the bodyguard Pausanias of Orestis since Philip 2 Macedon hasn't wanted to protect Pausanias of Orestis from insult from the relative of Philip 2 Macedon. Son of Philip 2 Macedon – Alexander the Great was suspected in the organization of this plot, motive for this crime could become the fact that Philip 2 Macedon has divorced with Alexander's mother, Philip 2 Macedon has sent them in the exile and married on other woman who could give birth to Philip 2 Macedon to other successor. It is necessary to avoid by union with the one who is stronger than you. The sovereign has to be avaricious, but not generous that not to plunder by citizens and that sovereign has to have means for defense. Nothing else exhausts by states as generosity. The sovereign has to be moderately cruel that to save by society from a disorder which generates by robberies and murders. All population suffers from it whereas only certain people suffer from punishments. It is more profitable for the sovereign when people afraid of sovereign than when people love to sovereign. Because people are ungrateful and changeable by own nature, people are inclined to hypocrisy and deception, people are frightened off by danger and the profit attracts. At the same time it is necessary to inspire by fear so that to avoid by hatred. It is necessary for this purpose to abstain from attempt at property and women of the citizens. Because people will forgive the father's execution, than loss of property rather. Hannibal kept by order in the different races army with help of inhuman cruelty. The sovereign can break the word of honor as required. Stalin acted quite so also. The sovereign shouldn't excite by contempt for himself. Sovereigns excite contempt for themselves because of the inconstancy, levity, delicacy, cowardice and indecision. Decisions of the sovereign have to be irrevocable. It has to come to mind to nobody to deceive or outwit by the sovereign. The sovereign has to create by own acts to himself by glory as the great person with outstanding mind. People judge about mind of the sovereign by those men whom sovereign chooses to himself in advisers. People act differently, trying to achieve by wealth and glory. One people act with caution, others people act with impact, one people act by force, others people act wih art. If the sovereign wants to keep by power, sovereign hass to recede from good, moral standards sometimes and to use this ability as required. People judge about the sovereign by the end result therefore let sovereigns try to keep the power and to win a victory. All means are good for this purpose. 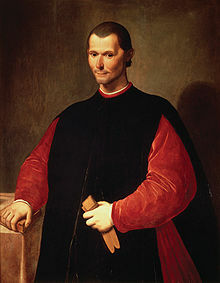 Conclusion: The treatise by Niccolo Machiavelli "The Prince" became the political textbook for applicants for a throne, for tyrants, like Joseph Stalin and Adolf Hitler. This page was last edited on 21 July 2018, at 02:52.